Do you have a PowerShell module or script with nice PowerShell functions and want to get them under a test-harness ? Do you want to write unittests for your functions and need a testrunner? $updatedFile = Update-VaultFile -File "$/Test/Test.ipt" -Status "For Review"
This is a function that is able to update the status of a file in Vault. It returns the updated file. Would it not be nice to write a test for this function ? If you have the correct test in place, and you do changes in your function Update-VaultFile, you can be sure that this functionality is not destroyed or affected by the changes! 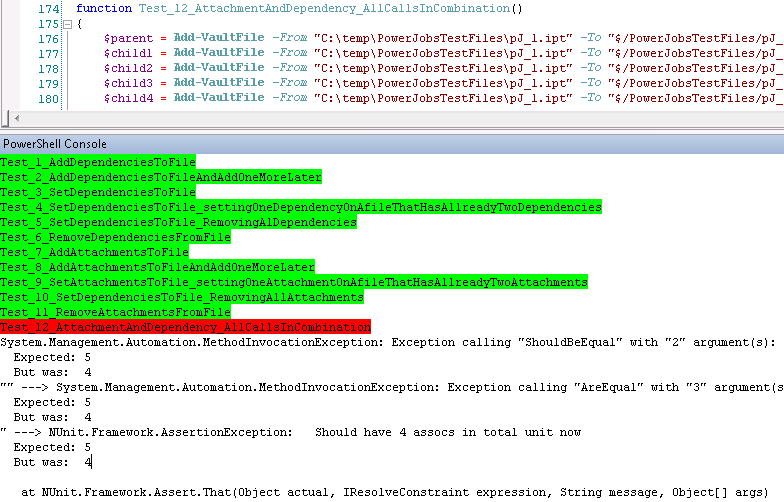 This would work, but it is three lines of code, just because of one simple assertion. We could use the powerful unittesting-framework NUnit instead. But how can we do that? I did the work for you and created a module that can be imported in your PowerShell session. Then you can use its functionalities and extend them very easily! It’s incredible, but we attached this functions on all the objects derived from System.Objects! By calling ShouldBeEqual, that Nunint-framework functionality Assert.AreEqual will be called and if the assertion is false, it will throw automatically the exception. Now you have the framework up and running, but how can you write tests and execute them? $updatedFile = Update-VaultFile -File "$/Test/Test.ipt" -Status "Some wrong status"
Just place functions without parameters where the function name starts with “Test_”, and the PowerShell-Testrunner will execute them for you. If you are interested, just download cONunitPowerShellExtension and extract the module to one of your PowerShell-module directories (a.e. C:\Windows\System32\WindowsPowerShell\v1.0\Modules). Import the module with “Import-Module cONunitPowerShellExtension” and feel free to extend the ps1xml-file with other more powerful functionality from the NUnit framework. This entry was posted in Data Standard, powerJobs, PowerShell, Uncategorized and tagged Nunit, PowerShell, ps1xml, testrunner, unittesting. Bookmark the permalink.